Professor Bashir Al-Hashimi has been awarded a CBE for services to engineering and industry. 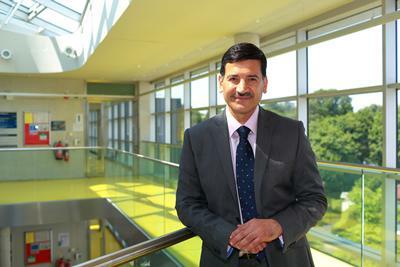 University of Southampton Professor Bashir Al-Hashimi, Dean of the Faculty of Physical Sciences and Engineering, has been awarded a CBE (Commander of the Most Excellent Order of the British Empire) in the Queen’s Birthday Honours 2018 for his services to engineering and industry. Professor Al-Hashimi joined the University of Southampton in 2000 as a Senior Lecturer and was appointed to a Personal Chair in 2004. He became ARM Professor of Computer Engineering in 2008. “I am honoured to receive this prestigious recognition,” said Professor Al-Hashimi. Both within the UK and overseas, Professor Al-Hashimi is a leading and influential figure in the science and engineering of energy-efficient computing, which remains a key enabling technology to underpin our digital world. He has been instrumental in building the University of Southampton's reputation as a world-class centre for Electronics and Computer Science education and research and is recognised nationally and internationally in relation to his academic research and leadership, including his election as a Fellow of the Royal Academy of Engineering in 2014. Professor Al-Hashimi works extensively with the electronics design industry and many of the outputs he has developed personally or in conjunction with his research team are used by companies in the UK and abroad. He advises national academies, research councils, professional and governmental bodies on strategies and policies relating to funding and the development of future leaders. Professor Sir Christopher Snowden, Vice-Chancellor at the University of Southampton, added: “Professor Al-Hashimi richly deserves this recognition for his outstanding contributions to engineering, bridging the gap between technical innovation in universities and application in industry, gaining him international recognition for his innovation and technical leadership.